Uber's self-driving car tests are set to begin once again "in a few months," Uber CEO Dara Khosrowshahi said on Wednesday. Khosrowshahi was speaking at Uber's Elevate conference in Los Angeles when he made the announcement, reports The Verge. Uber had suspended all self-driving tests following a fatal crash in Tempe, Arizona in March. An Uber self-driving car struck a pedestrian who was walking outside of a crosswalk at night, and the pedestrian later died of her injuries. The US National Traffic Safety Board is conducting an investigation into the crash, and its report should be done soon. Once it's in, Khosrowshahi said, Uber's self-driving tests are expected to start up once again. Uber has also undertaken an internal safety review following the Tempe incident. Not that everything will return to the way it was before the crash. 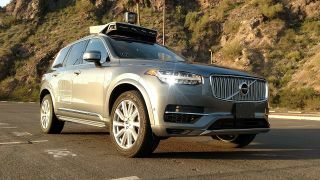 In the weeks following the fatality, Arizona's governor halted Uber's ability to test self-driving cars in the state. Uber also decided against renewing its self-driving testing license in California, leaving Pittsburgh, Pennsylvania as the only city where it can test self-driving cars.